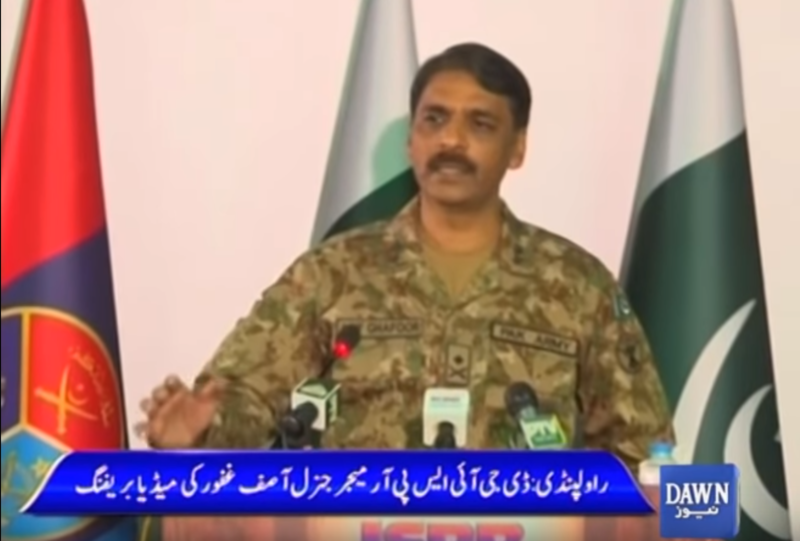 ISPR’s announcement that Gen Ghafoor’s infamous Tweet ‘rejecting‘ PM’s notification on so-called ‘Dawn Leaks’ has been ‘withdrawn’ is being treated as a victory for democracy. It is not. Allow me to explain why. The tweet on 29 April 2017 was not aimed at any government office or person. Recommendations as contained in Para 18 of the Inquiry Committee Report, duly approved by the Prime Minister, have been implemented, which has settled the Dawn leaks issue. Accordingly, ISPR’s said Twitter post stands withdrawn and has become infructuous. Pakistan Army reiterates its firm commitment and continued resolve to uphold the constitution of the Islamic Republic of Pakistan and support the democratic process. There are a few key items to note. First is that the statement begins with a completely ridiculous and unbelievable claim. Gen Ghafoor’s Tweet said ‘Notification on Dawn Leak is incomplete and not in line with recommendations by the Inquiry Board’. That is a specific notification that was issued by a specific government office of a specific person, namely the Prime Minister. This is how it was understood by everyone, and to try to pretend otherwise only confirms the inappropriate and unprofessional nature of the original Tweet. Most importantly, though is the beginning of the third sentence: ‘Accordingly’. This follows a recognition that PM implemented the Inquiry Committee’s recommendations (a committee that included representatives of ISI, MI, and IB). Army’s new statement says recommendations of the Inquiry Committee have been implemented, therefore Army is withdrawing its Tweet. The reason Gen Ghafoor’s Tweet should have been withdrawn is that it was prima facie insubordinate as well as inappropriate and unprofessional and furthering suspicions and conflicts between arms of the state. Army’s new statement should have said, “The tweet on 29 April 2017 was inappropriate and is regretted. Accordingly, ISPR’s said Twitter post stands withdrawn.” Instead, Army said that it was withdrawn because PM implemented recommendations made by a committee including Army men. By doing so, Army has reserved the right to ‘reject’ future notifications by the PM if he fails to follow their orders. The fact that Army’s ‘withdrawal’ is being treated as a victory for democracy and a set back for the military only shows just how firm the military’s grip on the state is. This is not a victory for democracy, it is only a sign of how far we are from it. Dawn Hackers: Lynch Mob or Contract Hit Job? You have surely by now seen the alert. Dawn media group has been under attack by hackers since the last three months. All web sites are at risk from hackers who want to display some messages as pranks or spam, but this appears to be a more serious type of operation. So these hackers are not just trying to deface Dawn’s website, they are also targeting the individuals who work for Dawn. What are they looking for? For some clue, we might look at the time line of the attacks. Dawn first reported that they were being targeted by hackers in January, but the media group’s troubles started a few months earlier when they published a controversial report about a meeting between PM Nawaz Sharif and DG ISI Gen Rizwan Akhtar in which Pakistan’s growing international isolation and willingness to take on all militant groups was allegedly discussed. The report caused a panic in Rawalpindi and Islamabad. A Corps Commanders meeting was called and ISPR termed it ‘a breach of national security‘. PM House also released a strongly worded statement saying that publishing the report ‘had risked the vital state interests‘, and the reporter Cyril Almeida’s name was temporarily placed on ECL as if he were a wanted criminal. #DawnIsATraitor now publishing articles against Pakistani idealogy..
As usual, even media talking heads are smelling blood and promoting the narrative that Dawn is in league with India. Is it any surprise that some hackers have put Dawn and even its staff in their sights? The question is whether this attack on Dawn is an informal response of an angry group intent on punishing Dawn without any trial – in other words a lynch mob? It is difficult to pinpoint the source of social media trends which occur both intentionally or unintentionally. However, the extent of the hacking operations targeting Dawn mean this could be something else: A contract hit job funded by those with the means and motivation to silence a media group that they believe has breached national security. It is well known that the latest front in modern defence is cyber warfare and the battle for control of narratives and information. Cyber warriors operate like spies, lurking in the shadows of the internet and protecting their anonymity as a cloak to hide their goals and their methods. This gives state agencies who sponsor them cover of ‘plausible deniability’. Also like spies, many of cyber warfare operations are carried out by contractors, not uniformed soldiers, making it even harder to trace. But there are still clues that raise questions. Who can support a three months long hacking operation? And if it was only some hypernationalist vigilantes looking to bring down the Dawn website, why are they targeting reporters social media accounts? Could they be trying to search through DMs for any incriminating evidence? Could such an operation be carried out by one or two hackers, or is it a team that is working? And if this is the case, who has trained and organised this team of cyber warriors? There is another question, too. Most every other country treats hacking of media as an attack on national security. However in this case, there has been no response by security agencies, and no investigation has been demanded or announced. If it was believed that a cyber attack on a national media group was coming from Indian or other hostile agencies, surely there would be an appropriate response. In this case, though, the attack is met with silence. Is that silence a sign of approval? Prime Minister’s Special Assistant on Foreign Affairs Tariq Fatemi is expected to resign over allegations of his involvement in leaking the information contained in the controversial Dawn report by the special committee set up to investigate the leaks. If he is found to have leaked sensitive or secret information, it is appropriate for him to resign or be sacked to stop future leaks. Problem of leaking is only one part of the problem, though. There is also the issue of a massive hacking operation targeting national media. Unfortunately, till date there has been no sign of any interest in investigating or acting against those responsible. Actually, it is quite the opposite. Without an official investigation and report, this will leave the answers about who is behind it to your own imagination.